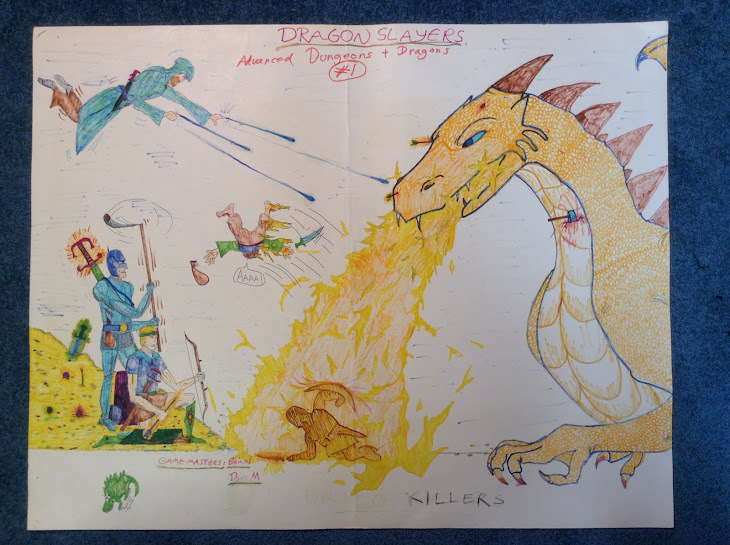 AKRATIC WIZARDRY: A blog wherein I scribble about various old school fantasy role-playing games (Classic D&D and AD&D, Call of Cthulhu, BRP, Elric!/Stormbringer, MERP, etc.) and a few newer ones (Mythras, Crypts & Things, 5e D&D, Adventures in Middle-Earth, etc.). I also write about fantasy and science-fiction films, novels, art, TV shows, and the like. It’s with some sadness that I note the approaching end of summer. I’ve been living in Toronto since January, thanks to a research grant that gave me one term of ‘teaching relief’ from my regular job ‘professing’ in Wisconsin. This enabled me to focus on writing a few academic articles. During the past eight months I’ve enjoyed some great gaming. I ran a sporadic but fun Call of Cthulhu campaign, set in 1923 Toronto. We only managed to complete three adventures (in four sessions), but I look forward to restarting it again in the future. I’m horribly far behind in the logs for both the ‘Cthulhu Canada’ and the ‘No Reason for Waking’ (Elric) campaigns. But I have good notes for both, and look forward to bringing them up to date during my gaming hiatus in September. Since I’m about to move back to Milwaukee, and have to get ready for the autumn term, I doubt that I’ll have time to post anything new here for at least a week (possibly longer). 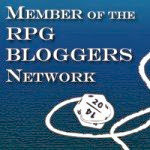 Frog God Games kindly has made available a number of free downloads for the Swords and Wizardry FRPG here (go to the August 26th, 2011 post, if the blog has been updated). Contrary to my earlier declaration, I ended up seeing Conan the Barbarian 3D. As expected, the film was rubbish. The opening scene especially was awful. 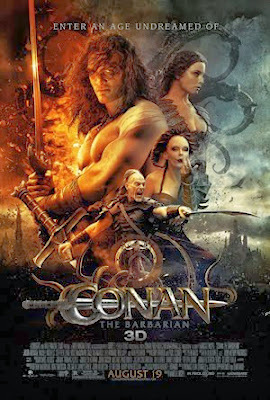 Fortunately, the rest of the film was not quite as bad, and there were a few fight scenes that I rather enjoyed (such as an early one with young Conan and a Pictish raiding party, and a later one in which Conan fights a number of magically-created ‘sand demons’). But overall, the story, to the extent that there was one, was insipid, and the dialogue often groan-worthy. It was not exactly worse than I expected, but then I had very low expectations! Also grating was the 3D. I’m not a fan of 3D in general, and very much hope that its days are numbered (or at least that it becomes standard that 2D versions become available for all films). But the 3D for this film was especially bad. I often felt like I was watching the film through a muddy lens. This is a pity, since I think that some of the vistas might have been quite impressive, had they simply been filmed normally. In short, the 24 percent ‘freshness’ rating at Rotten Tomatoes seems pretty spot on. Despite my low opinion of the film, though, I can’t help but feel a bit sorry for the film’s ‘script doctor’, Sean Hood, given the thoughts he expresses in this post. An OpenQuest ‘Renaissance’ is coming soon! No, I do not mean a ‘rebirth’ of interest in the OpenQuest FRPG (the game was only recently ‘born’!). Rather, I refer to the new system that Cakebread and Walton will be publishing in December. The system, entitled simply ‘Renaissance’, is based upon OpenQuest, but has been adapted for Renaissance-era games. Cakebread and Walton plan on using this system in order to re-launch their brilliant Clockwork and Chivalry setting, as well as to complete the C&C ‘Kingdom and Commonwealth’ campaign. Fortunately, for those who already have purchased the MRQII C&C books and/or who plan to continue to use MRQII for their games, Cakebread and Walton promise to make available helpful conversion documents. 1645: England has descended into civil war. Prince Rupert and his Alchemist-Cavaliers fight on behalf of their exiled king against the clockwork war machines of Oliver Cromwell and the New Model Army. Between them, a host of political and religious factions struggle for survival. First launched to critical acclaim as a series of supplements for RuneQuest II (“The best British fantasy setting since WFRP 1st edition” said Newt Newport), Clockwork & Chivalry now returns in a standalone 2nd edition featuring the new Renaissance rules, a D100 open gaming system based on OpenQuest and compatible with 1st edition supplements. Fast, brutal, and geared up to a world of black-powder weapons and political machinations, the new rules will also be the bedrock of a series of RPGs forthcoming from Cakebread & Walton: Purveyors of Fine Imaginings. Alchemists, diggers, dragons, engineers, mercenaries, puritans, ranters, royalists, satanists, thieves, witches, zombies... which side are you on? As many of you probably know, Mongoose Publishing will cease to support the RuneQuest II license in the autumn, and this has left us with a big decision to make regarding the future of Clockwork & Chivalry. Giving up on the line was never an option – we were determined to finish the Kingdom & Commonwealth Campaign, and have other ideas we want to develop for the game world. At the same time, we value our autonomy as a small independent games company. The new Renaissance system will be based on OpenQuest and will aim to be as compatible as possible with existing C&C supplements. At the same time, this rule-set, stripped of the C&C background but incorporating some of the rules (such as Righteousness Points and Factions) will be released under an Open Gaming License as a free download. The rules will be aimed squarely at role-playing in the age of black powder weapons. The creation of Renaissance will give Cakebread & Walton a solid rules set for the development of further games in the future, as well as allowing others to use it in their own games under the terms of the OGL. Once Clockwork & Chivalry 2nd Edition is released, we'll be re-issuing the first 4 parts of the Kingdom & Commonwealth campaign with minor tweaks to fit the new rules, and then the last two books in the campaign, Hobbes: Leviathan and London Calling. We'll also release a small conversion document so that those playing C&C with the existing RuneQuest II Core Rulebook need not change rules to finish the campaign. C&C2, a 400 page core rulebook including all the rules you need to play as well as all the background in the original worldbook and then some, will be out in December. The other revised volumes and new C&C2 supplements are to follow in 2012. 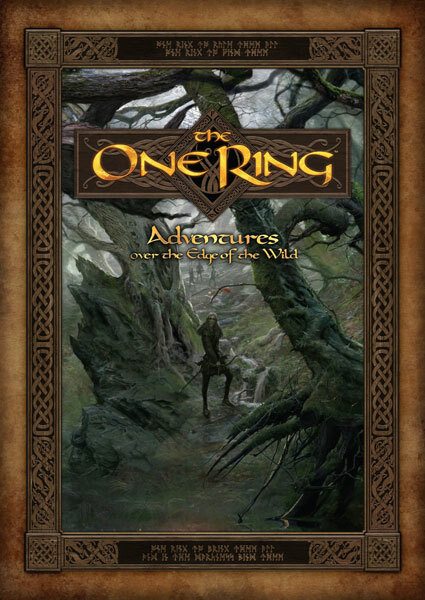 As usual, our games will be distributed by Cubicle 7 Entertainment and will be available from all good game stores! It’s good to see that Clockwork & Chivalry will continue, that the Renaissance FRPG will enable Cakebread and Walton to be ‘masters of their own domain’, so to speak, and that OpenQuest will enjoy some excellent support! I recently purchased the PDF of The Tome of Horrors (the Swords and Wizardry version; there also is a Pathfinder version) from Frog God Games. It is 688 pages long (but with 14 pages of advertisements at the end), with a monster description on almost every page (some have two). Some of these creatures are taken from classic AD&D (1st edition) volumes, such as The Fiend Folio and the Monster Manual II. Along with each monster description is a brief ‘sample lair’ that can be used when designing encounters. Normally I prefer paper books over PDFs, but in this case the PDF is ideal, as one can print up the relevant pages for a gaming session without having to lug around a massive volume. I haven’t had time to look at the PDF closely yet, but my initial impression is very favourable! It's unsurprising -- but disappointing nonetheless -- that the new Conan the Barbarian film has a 'freshness' rating of only 27% at Rotten Tomatoes. Where in the Young Kingdoms is Nassea-Tiki? 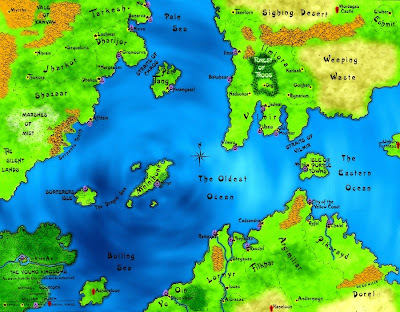 The story, which was written in 2007, mentions a few places that have not been mentioned in any earlier Elric stories (to my knowledge), are not shown on any existing maps of the Young Kingdoms, and are not mentioned in the most recent RPG game based upon the series (MRQII’s ‘Elric of Melniboné, by Lawrence Whitaker). These places include the bustling port-city of ‘Nassea-Tiki’ and the ruined city of ‘Soom’. Apparently ‘Soom’ lies upriver, deep in a jungle, from the coastal city of Nassea-Tiki. Moreover, Nassea-Tiki, while some distance from the Young Kingdoms detailed in Moorcock’s stories, clearly has extensive trade relations with those realms. Neither city, though, was ever ruled by the Bright Empire. Since this story is so recent, I certainly cannot fault Lawrence for not including it in Elric of Melniboné (which is remarkably comprehensive). And it is obvious why Nassea-Tiki and Soom would do not appear on any maps yet produced. I’m curious, though, as to where in the Young Kingdoms Nassea-Tiki could plausibly be located. Looking at the Young Kingdoms map, and taking into account that the city is adjacent to a jungle, and that Soom lies ‘upriver’ (inland), I have no idea! 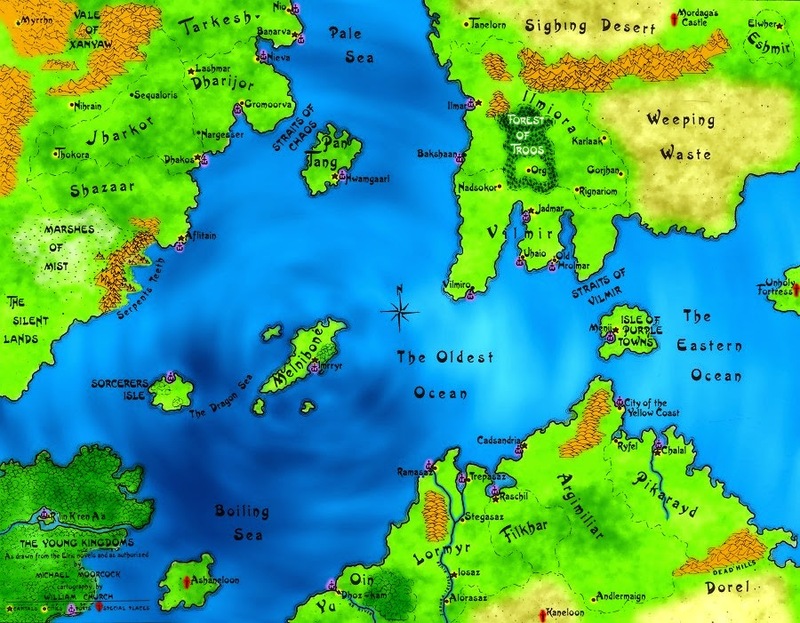 The ‘Unknown East’ clearly is ruled out by the large number of merchants from the Young Kingdoms present in Nassea-Tiki. The northeast continent looks impossible (no jungles, etc.). The southeast continent looks implausible, although I suppose that the city might be located south of Yu or (less plausibly) south of Dorel. That leaves the northwest continent, west of The Silent Lands, or somewhere on the southwest continent. The southwest continent looks most promising, as it’s covered with jungle. But the presence of a major port city there would seem to conflict with Moorcock’s earlier descriptions of that continent. But perhaps it should simply be ‘retconned’ there? I’ve been really excited about going to OSRCon for a couple months now. However, thanks to an unforeseen ‘real life’ issue (work-related), it turns out that I will not be able to go this Friday and Saturday. That means that I will not be able run my Swords & Wizardry game, take part in one of the games that James Maliszewski (of ‘Grognardia’ fame) is running, meet Stuart (creator of the ‘Weird West’ RPG), meet some other ‘old school’ Toronto gamers, and enjoy the con events. I’m grateful to the con organizer, Chris Cunnington, for being so understanding. I really hope that OSRCon is a great success! Hopefully it will happen again next year, when I’ll be back in Toronto. My Young Kingdoms campaign also has suffered lately, thanks to travel and work (no sooner does one participant get back from Germany than another heads off to France, etc.). We only met once in June and once in July. Hopefully we’ll be able to squeeze in at least two more meetings – including one ‘mega session’ – before the end of August. By Crom, 'real life' can be so annoying! Despite being a huge Tolkien fan for 30 years now, I haven’t been following the development of the Cublicle 7’s The One Ring RPG too closely. However, I recently noticed that a summary of the main rules of the game (except combat) has been posted here. I must confess that I’m somewhat intrigued! I’m still not sure whether it’ll be my cup of tea, but I think that I’ll definitely check it out. My main concern remains that it seems overly focused on a particular era and region of Middle-earth. 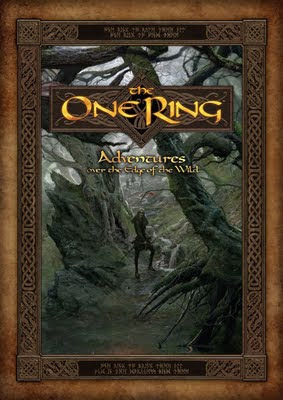 It’s definitely a different approach to a Middle-earth RPG than my beloved (but long out-of-print) MERP. Irrespective of the quality of TOR’s rules, though, art by John Howe and Jon Hodgson ensures that this will be one very attractive product! It seems that Fantasy Flight Games has acquired the license to produce 'Star Wars' games, including (eventually) a RPG. Fantasy Flight Games is pleased to announce that it has entered a comprehensive licensing partnership with Lucasfilm Ltd. for the worldwide rights to publish card, roleplaying, and miniatures games set in the popular Star Wars™ universe! I've never been a big Star Wars fan (aside from a brief period during my 'pre-RPG' life, around 1977-80), so I'm not terribly excited about this development myself. Nonetheless, it clearly is 'big news' for the RPG 'industry', and evidence of FFG's growing importance. I'm a Canadian political philosopher who divides his time between Milwaukee and Toronto.